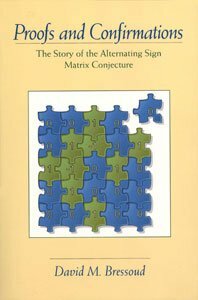 This month I return to the MAA Calculus Study, Characteristicsof Successful Programs in College Calculus, with a report on what we learned about the effects of taking calculus in high school. Because this study only looked at students in Calculus I, we can say nothing about how many of these students never take another calculus class or how many start their college mathematics with Calculus II or higher. Since the survey was conducted in the fall term, we cannot even say anything about students who might postpone taking Calculus I until later in the academic year. But, thanks to this survey, we can say a lot about the students who study calculus in high school and then begin with Calculus I in their first term at college. First of all, we have a good idea of how many students this involves. Of the 300,000 who enrolled in Calculus I in fall 2010, just over half had studied calculus in high school. That represents just about one quarter of the 600,000 or so students who had studied calculus in high school the previous year. Of those who had taken the AP Calculus exam that spring, just over a quarter were in Calculus I that fall. From the latest CBMS report , about 55,000 incoming freshman arrived with credit for Calculus I. This leaves almost two-thirds of those who studied calculus in high school neither acquiring college credit for their high school work nor enrolling in Calculus I in a fall term. Half of those who scored a 1 or 2 on the BC exam or a 3 on the AB exam enrolled in Calculus I in the fall. A third of those who scored a 3 on the BC exam enrolled in Calculus I. A quarter of those who scored 1, 2, or 4 on the AB exam enrolled in Calculus I. 1 in 8 of those who scored a 5 on AB or a 4 on BC enrolled in Calculus I. 1 in 20 of those who scored a 5 on BC enrolled in Calculus I. A quarter of those who scored a 3 or higher on the AB or BC exam received college credit for Calculus I. 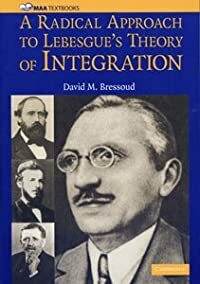 Of those who arrived with credit for Calculus I, we do not know how many used it to place into a higher calculus class and how many never studied any further calculus in college. At the research universities, those characterized by offering a doctorate in mathematics and dominated by the flagship state universities, over 70% of the students in Calculus I had completed a course of calculus in high school. We have data for about 5,000 of these students and so can report fairly accurately on the effect of studying calculus in high school on student performance in Calculus I in college. 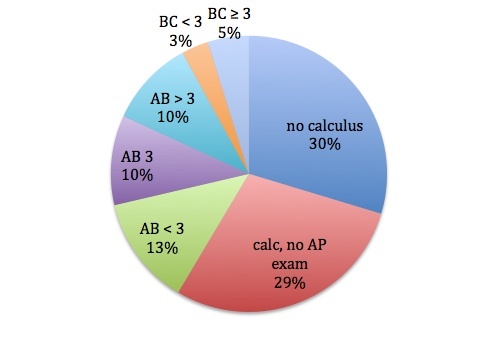 As shown in Figure 1, less than a third studied no calculus in high school, less than a third studied calculus but did not take the AP Calculus exam, a third took the AB exam, and a small but significant percentage (8%) took the BC exam. Figure 1: Distribution of high school calculus experience among Calculus I students at research universities. 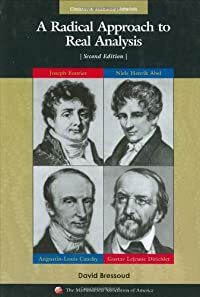 There is a common perception among students that having studied calculus in high school gives students a significant advantage in Calculus I when they get to college. Our data tend to confirm that. Figure 2 compares the final grades of the total student population at research universities with three subsets: those who did not study calculus in high school, those who did and did not take the AP Calculus exam, and those who did and did take the AP Calculus exam. We see a much lower percentage of A’s and a much higher percentage of DFW’s (grades of D or F or a withdrawal from the course) among students who did not study calculus in high school as opposed to those who did. There is little difference in Calculus I grades between those who did and those did not take the AP Calculus exam. Figure 2: Final grades of Calculus I students in research universities by experience with high school calculus. 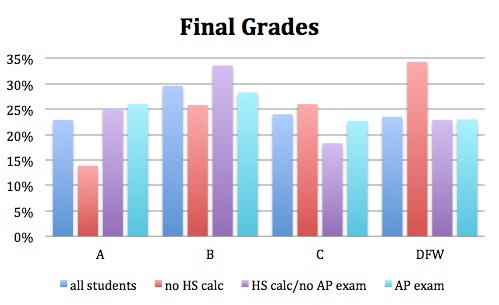 If we separate the grades of those who took the AP Calculus exam by their performance on this exam, we see that it makes a large difference in their final grade (Figure 3). Students who score a 1 or 2 on the AP exam are comparable to students who did not study calculus in high school, although there is a slightly lower probability of receiving a D or F or withdrawing from the course. Students with a 3 on the AB exam are comparable to the average student who took calculus in high school and did not take the AP Calculus exam, but with a somewhat higher probability of earning a B. Not surprisingly, students who earned a 4 or higher on the AB exam or a 3 or higher on the BC exam did very well in Calculus I: 45% received an A, over two thirds at least a B. It is interesting that even among these students, roughly a quarter received a D or F or withdrew from the course. In fact, the rate of DFW is remarkably consistent across all levels of preparation, suggesting that the decision to stop working or to withdraw from the course is one aspect of course performance that has little to do with high school preparation. 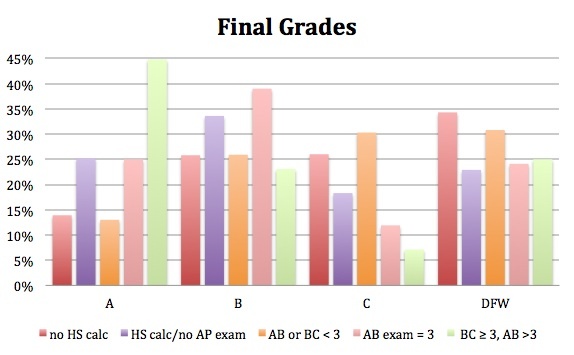 Figure 3: Final grades of Calculus I students in research universities by performance on AP Calculus exam. The MAA national study of calculus, Characteristics of Successful Programs in College Calculus, is funded by NSF grant no. 0910240. The opinions expressed in this column do not necessarily reflect those of the National Science Foundation.